Located in Almaty, Shagan Hotel features accommodation with a classic décor. Guests will find shops and restaurants at the shopping mall, 250 yards away. 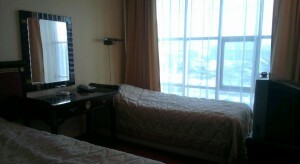 Rooms all come with a TV and a work desk. Each has a private bathroom. Almaty 2 Train Station is a 5-minute drive from Hotel Shagan. Almaty International Airport is 9.3 miles away.